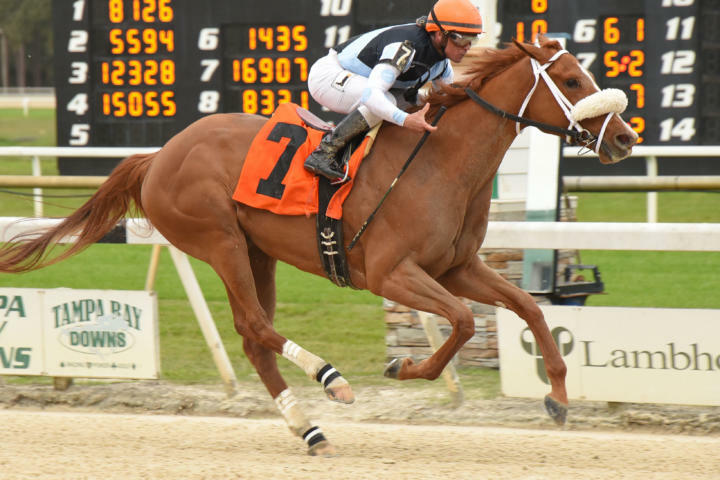 A wide trip proved no hindrance to Point of Honor, who entered the Kentucky Oaks (G1) race Saturday with a stylish 2 3/4-length victory in the $100,000 Suncoast at Tampa Bay Downs. The 5-2 favorite in a field of eight, Point of Honor wore down Lady Kate in upper stretch and drew away impressively under Javier Castellano. Finishing third was Sweet Diane, and fourth was Winning Envelope. The final time for one mile and 40 yards on a fast track was 1:39.78. Paying $7 to win, Point of Honor is owned by Eclipse Thoroughbred Partners and Stetson Racing, and is trained by George Weaver. Point of Honor earned 10 qualifying points as the Suncoast was part of the Road to the Kentucky Oaks series. Lady Kate earned four points, Sweet Diane two points, and Winning Envelope one point. Bred in Kentucky by Siena Farms, Point of Honor won on debut by six lengths at Gulfstream Park in an off-the-turf maiden going 1 1/16 miles. She’s now earned $84,000. By Curlin, Point of Honor is out of the Bernardini mare Zayanna and is a half-sister to stakes winner Velvet Mood. Zayanna is herself a half-sister to Grade 3 winners Mr Freeze and Dilemma. Point of Honor descends from multiple Grade 1 winner Sabin.